It was hard to believe that after only one day in Greve in Chianti we’d be invited out to dinner. Even more curious was that we had been befriended by two influential winemakers grappling for our attention. The wine flowed freely and the 4 course dinner was being delivered to us along with 200 locals. 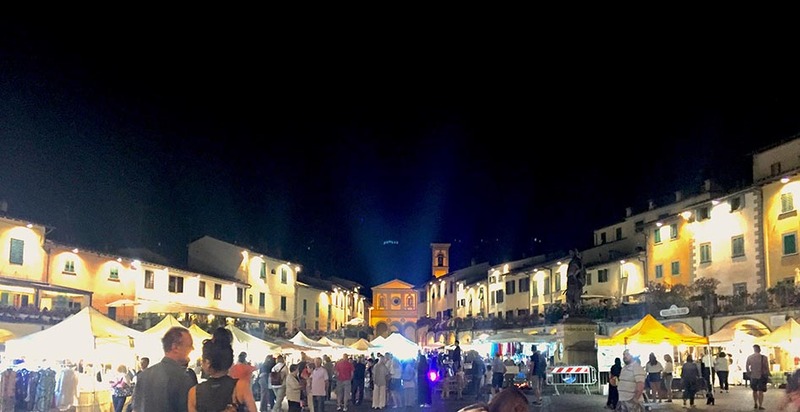 All seated at long tables extending down a cobblestone lane way leading out of the piazza. We soon realised that we were actually the tourist attraction in this out of the way destination in Tuscany. After a gruelling cycling tour of Cinque Terra, a few days was required for some rest and relaxation. Our hectic three-week European adventure had two days of respite pencilled in. It was our holiday within a holiday. 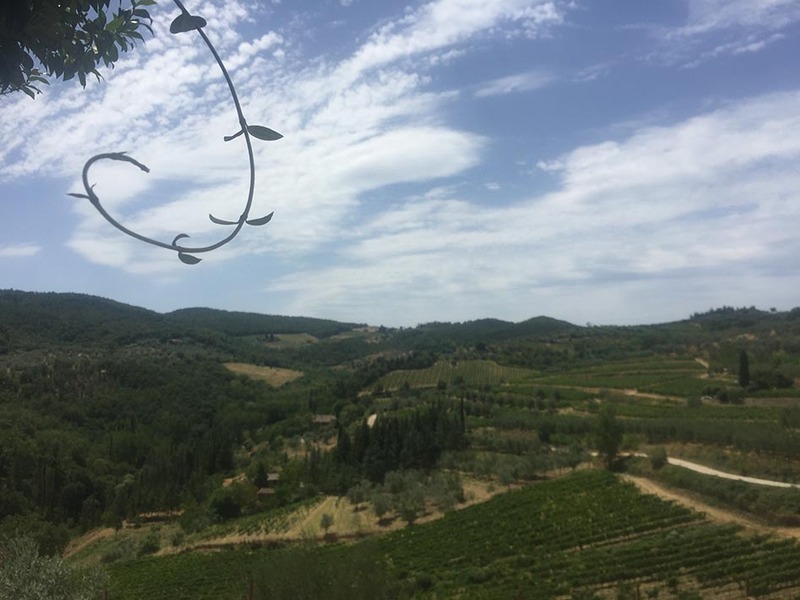 After scouring maps, available accommodation and transport options in central Italy, all roads led to Greve in Chianti, well positioned in the rolling Tuscan hills not too far south of Florence. A train from an over-rated leaning tower in Pisa took us to a crowded, sweltering Santa Maria Novella train station in Florence. Was this the right move? Where was the laid back serenity? A taxi was hailed amid the chaos which quickly pulled out into the traffic and proceeded to take every back road in town. I cautiously followed the blue dot on Google Maps as it moved south toward Greve in Chianti. I was now relieved the pronunciation of our destination had been communicated effectively. The taxi dropped us in Greve near a neat looking Piazza Giacomo Matteotti. This it seemed was the central hub of the town. Lain with cobblestones and surrounded by ochre rendered buildings of varying heights, it was an impressive yet simplistic piazza. Verandahs circled the piazza containing various cafes, bars, restaurants and cellar doors. Umbrellas were also popped open on many outdoor tables to shelter from the afternoon sun. 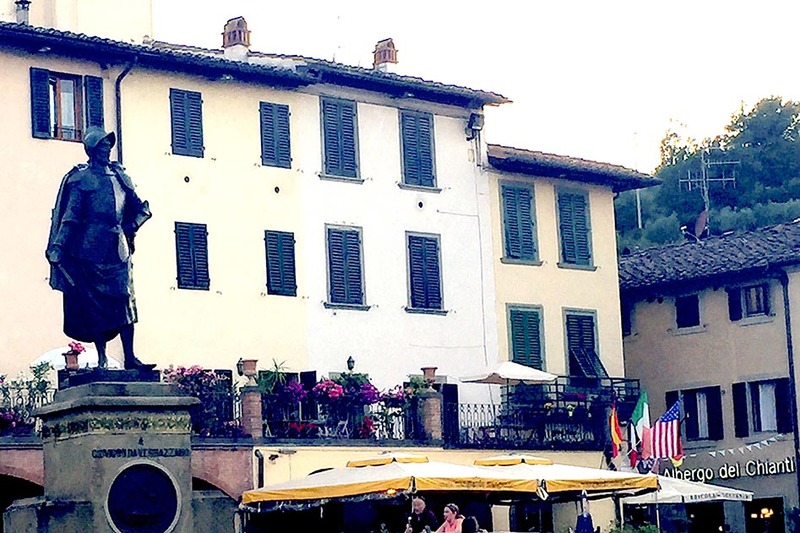 The Piazza holds a statue of locally born explorer Giovanni da Verrazzano. Verrazzano discovered many parts of the North American coast from Florida up to Newfoundland. Verrazzano was the first European to set eyes on the Hudson River. The Verrazano-Narrows bridge over the entry to New York harbour is named in his honour. We were booked in at Albergo del Chianti, a small but well reviewed BnB just off the square, importantly, containing a sizeable pool. The pool was our first stop after dropping our bags in our modest double room. We mentally washed off what had been a hectic day to this point and let relaxation take hold. Lounging on the sun beds the remainder of the afternoon. 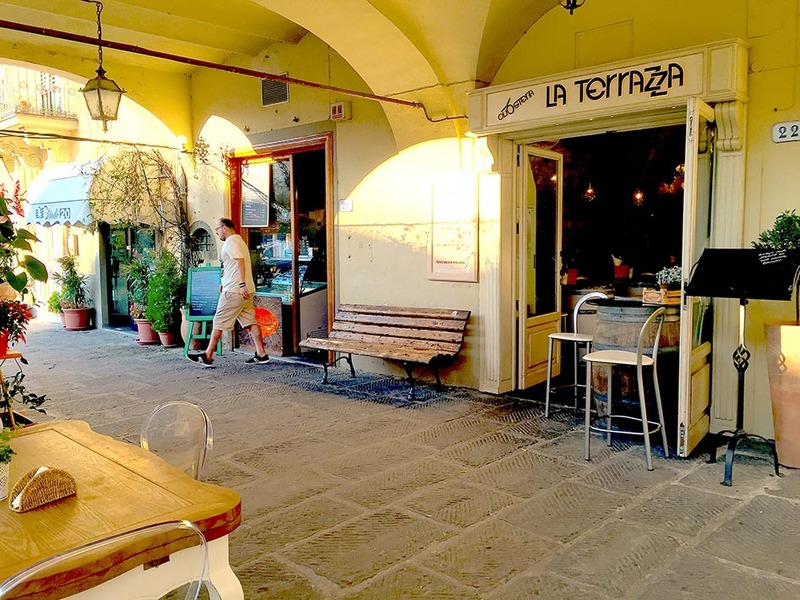 An pleasant early evening visit to La Terrazza on the piazza followed. We sampled a few glasses of some decent Chianti served with a complimentary cured meat, cheese and olive board. With our appetites now warmed up we moved on to la Bottega del Moro Ristorante, located just outside the central piazza next to a small park. A delicious meal was had including a delightful steak and a bottle of the local Chianti really continued the relaxed vibe we’d been seeking the past few days. Chianti, we discovered, was not just drunk by movie based cannibals with a side of fava beans. Chianti is made with over 70% Sangiovese grapes and can be only considered Chianti Classico if it is produced in the specifically nominated regions in Tuscany. The Chianti Classico can be identified the world over by the black rooster emblem appearing on the neck and seal of the bottle. So important is this exclusive branding that many towns in the region, like Greve, have appended Chianti to their name. The next morning we took a hike up a steep road to the historic walled village of Montefiorelle. A very quaint and pretty village with a sleepy feel. Only one or two tourists wandered aimlessly about. After briefly looking at the main church, we stumbled upon the only open cellar door. Here we met Maurizio who ran his family owned winery located nearby. Maurizio was happy to share some wine, bread, olive oil and cheese with us as he told us his story of the Maurizio Brogioni Chianti which bore his name and of course the requisite rooster for the region. We picked up a bottle and some olive tapenade for our efforts. After our visit to Montefiorelle we got on a roll. We made our way through the Greve cellar doors sampling these lovely Sangiovese based wines with some eagerness, collecting six or seven bottles in the process. We finished up at il Vinaino de Greve chatting with the proprietor Donatella. A sign out front had promoted postage of wine to anywhere in the world. The only catch being the postage to Australia was nearly double the total cost of our wines purchased to date! A round-a-bout plan ensued, the end result was wine was sent to the UK to old mate Dave to be our wine mule back to Australia during an upcoming trip! Thanks Dave! Donatella was fantastic arranging it all. On leaving she asked if we wanted to join the long table street event planned to run that evening which would occur right in front of here store on via Roma. “Count us in!” we replied. Il Vinaino Di Greve, wine merchant and very helpful proprieter, Donatella. After our second siesta by the pool in as many days we made our way back to via Roma, only one block from our B&B. A 10 Euro donation was required for a seat at the table. This included a 4 course meal and seemingly a help your self approach to the wine positioned at regular intervals down the table. And, what a table! It ran about 100 metres along the cobblestone laneway. The accompanying bench seats were filling fast and we eventually positioned ourselves outside Donatella’s store at her welcoming insistence. We were seated near 4 couples of about 60 years old who were busily chatting to each other so initially paid us little attention as we sat down. We helped ourselves to the already opened wine on the table and attempted chatting with our surrounding patrons who were decidedly local and the language barrier excluded us from engaging deep in conversation. The first course came which was dished out super efficiently by a team of volunteers. More wine flowed and we had some more success in engaging the locals, including Donatella. A familiar face was walking towards us and it turned out to be Maurizio. We caught his eye so he popped over to briefly to wish us well. A few heads heads now turned our way. A few minutes later Maurizio returned and plonked a bottle of his own wine on the table in front of us. A very nice gesture. A gesture which was now drawing even more attention from our surrounding dining companions. We popped the top of Maurizio’s wine. It would be rude not to! Our offer of wine to our dining companions was warmly accepted. Even Donatella was keen to try some in comparison to her own wine which it turned out we’d been drinking thus far. 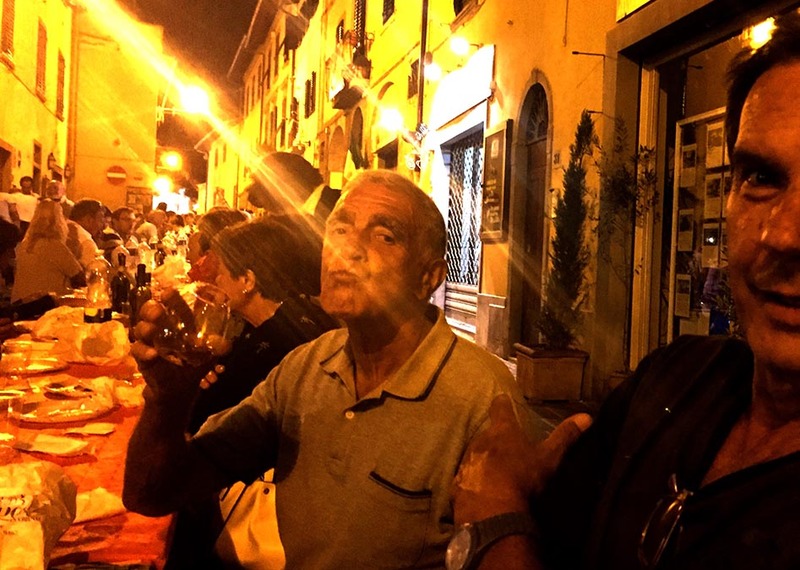 Maurizio had given us some serious street cred from the locals at our table! Like we’d just been blessed by the godfather of Greve in Chianti! Maybe it was the amount of wine now consumed but we were all a lot more animated with our conversation and continued well into the evening. The locals warming up to our presence in Greve. 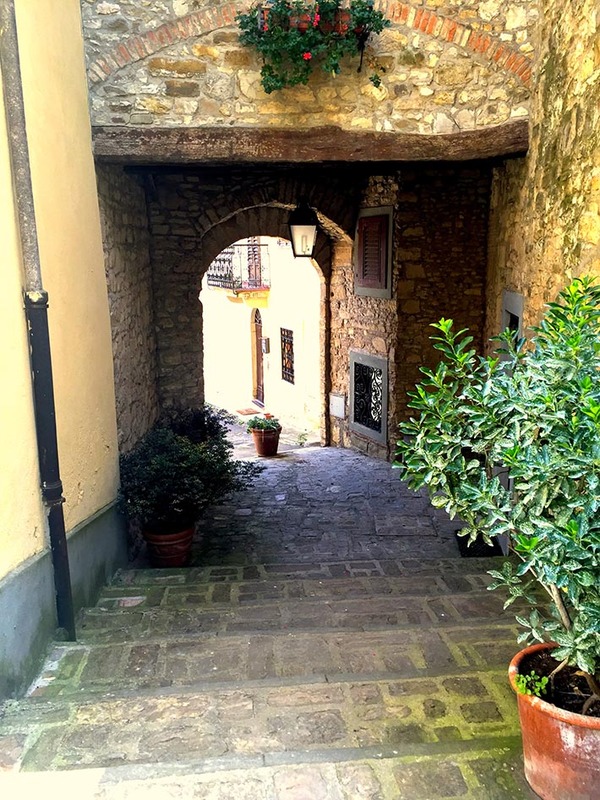 Our stay in Greve in Chianti was an unexpected surprise on our European adventure. A great local community and laid back atmosphere with great hospitality. Florence attracts many to experience various works of renaissance artists and architects. 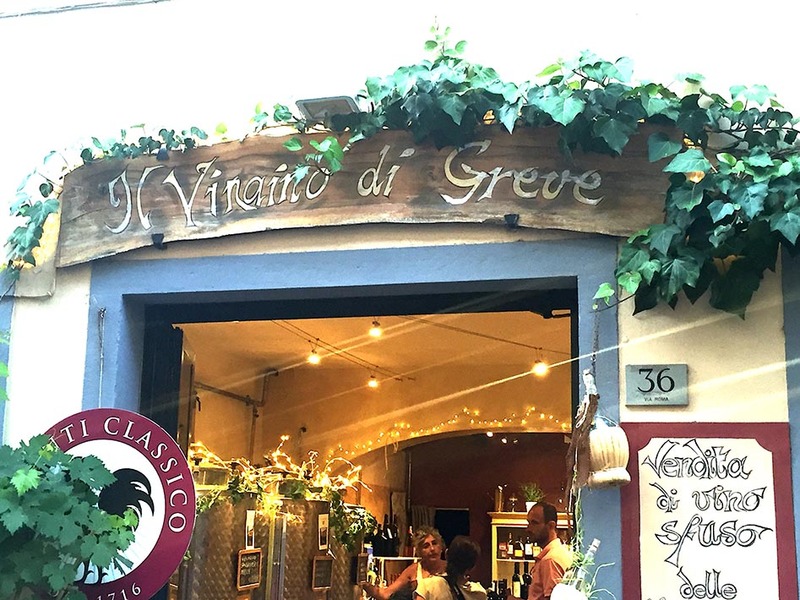 It would be wasteful though not to head a short way south to take in Greve in Chianti. But don’t forget to head up to Maurizio overlooking the town from the heights of his castle in Montefiorelle! Taxi: A 30 minute taxi ride from Florence will be around 30 Euros. Bus: A decent regular service on the public SITA bus (route 365A) between Florence and Greve in Chianti takes just under an hour and is only 5 Euros. Make sure you have correct change!